HOLO! I mean that both as a greeting and reference to the amount of holo you will see before your eyes in the following post. February is almost here which means Valentine's Day nail polish! It's my favorite time of year because I love pinks and reds but I also love this unconventional take on Valentine's Day from Girly Bits for their February CoTM. I know you're intrigued too so read on, my friend. 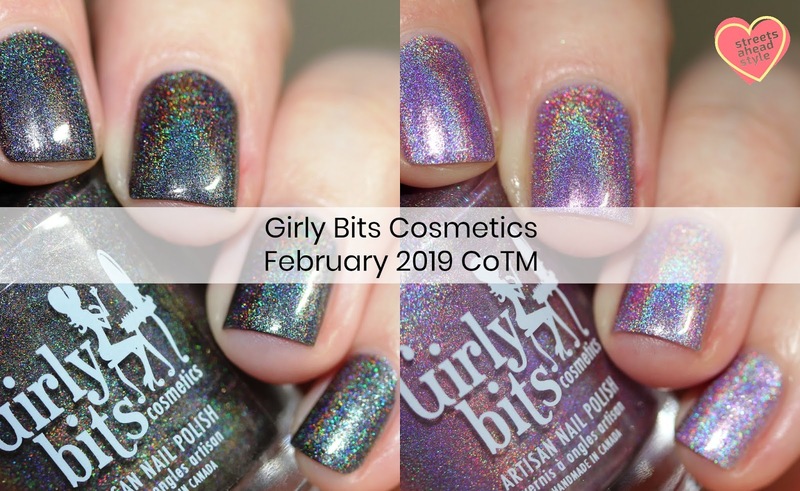 Girly Bits Steel My Heart is a slate grey holo. Did you eyes go all googly too? This holo is bodacious! The rainbows are off the chart in direct light or sunlight. This will be blinding in the Winter sun so be careful if you're out in public (you don't want to get too distracted and walk into a wall). I am wearing two coats plus top coat. Perfect holo formula and a glossy top coat will bring out the holo best - I would recommend Girly Bits What A Rush as it doesn't dull holo and makes my manicures last and last and last. 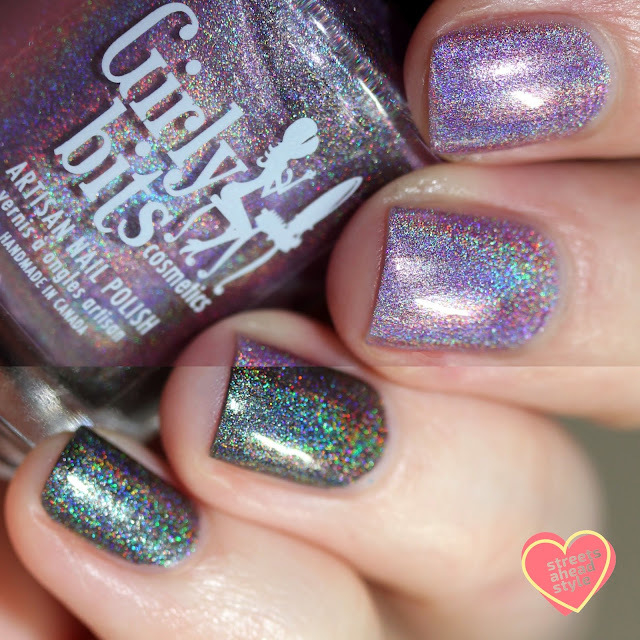 Girly Bits Budding Romance is a violet/pink holo. This polish is the definition of holo. If you had a dictionary with pictures, this photo would be beside the definition of holographic. I dare say this is my new favorite linear holo. It is almost lilac but more pink and there is this stunning baby blue within the holo rainbows that melds so beautifully with the base colour. This is a MUST HAVE HOLO. The linear rainbows in Girly Bits Budding Romance are surreal. Pick a sunny day and put this on for endless smiles and joy. I am wearing two coats plus top coat for maximum holo and gloss. Both polishes are 5 Free, cruelty free, and vegan. These polishes have been named by members of the Girly Bits Facebook group so make sure you join and suggest a winning name(s) for the next CoTM so you can receive the polish you named for free. Purchase the duo from the Early Bird Promo listing at a discounted price of $30 CAD from March 1-10, 2019. These polishes will be available individually through March 1 (so you can order the two months together and save on shipping) for $16.50 CAD each.